Václav Havel (Czech pronunciation: [ˈvaːtslaf ˈɦavɛl] ( listen)), 5 October 1936–18 December 2011, was a Czech playwright, essayist, dissident and politician. He was the tenth and last President of Czechoslovakia (1989–92). He then became the first President of the Czech Republic (1993–2003). He wrote more than twenty plays and many non-fiction works. Many of them were translated into multiple languages. Beginning in the 1960s, Havel mostly wrote about the politics of Czechoslovakia. After the Prague Spring, he became more and more active against the government. In 1977, he became famous internationally for his work on the human rights manifesto, Charter 77. He became known as a leader of the opposition in Czechoslovakia. He was also sent to prison for these activities. The 1989, Havel became president during the "Velvet Revolution". As president, he led Czechoslovakia and later the Czech Republic to an open democracy with several political parties. His country changed greatly during the thirteen years he was president. The Czech Republic separated from Slovakia, even though Havel was against separation. The Czech Republic also joined NATO and started negotiating membership in the European Union. The country became a member of the EU in 2004. He was one of the first people to sign the Prague Declaration on European Conscience and Communism. Václav Havel was born in Prague, Czechoslovakia on 5 October 1936. He grew up in a well-known and wealthy entrepreneurial and intellectual family. His family was active in culture and politics in Czechoslovakia from the 1920s to the 1940s. His father owned part of the suburb of Barrandov. This is the highest part of Prague. Havel's mother came from a well-known family. Her father was an ambassador and journalist. Havel completed his required education in 1951. However, the Communist government did not allow him to continue to study formally because of his bourgeois family background. In the early 1950s, the young Havel entered a four-year apprenticeship as a chemical laboratory assistant. He took evening classes at the same time and completed secondary education in 1954. None of the colleges or universities with humanities programs would accept Havel for political reasons. So, he chose to study at the Faculty of Economics of Czech Technical University in Prague. He dropped out after two years. In 1964, Havel married Olga Šplíchalová. His mother was against the marriage. Havel was already leader of the Civic Forum, and on 29 December 1989, he became president. He left office after his second term as Czech president ended on 2 February 2003. Every member of the Federal Assembly voted to make him president. This was a surprising change because Havel had always said that he was not interested in politics. He and other dissidents had said that change should come from groups of people directly, not from the government. Czechoslovakia had free elections in 1990. Havel won and continued to be president. 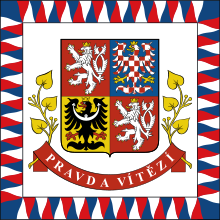 Havel wanted to keep the federation of the Czechs and the Slovaks together during the breakup of Czechoslovakia. He supported keeping the country together even though this was difficult and there was a lot of pressure. On 3 July 1992 the federal parliament did not elect Havel — the only candidate — because Slovak MPs did not support him. Havel resigned as president on 20 July after the Slovaks issued their Declaration of Independence. He stood for election as president of the new Czech Republic in 1993. He won and became president of this new, separate country. 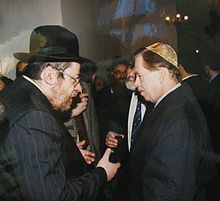 Havel said that the most important thing he did as president was breaking up the Warsaw Pact. Ending this group of countries was very complicated because the association was a deep part of how the countries worked. It took two years before the Soviet troops finally left Czechoslovakia completely. Havel was very important to changing NATO. He helped change it from an anti-Warsaw Pact alliance to a group that includes former-Warsaw Pact members. Havel spoke very strongly for expanding of the military alliance into Eastern Europe, including the Czech Republic. USA Presidential Medal of Freedom 07/2003 Washington D.C.
↑ "Prague Declaration - Declaration Text". 3 June 2008. Retrieved 28 January 2010. ↑ Vaclav Havel — Biography. The official website of Vaclav Havel. Retrieved 4 June 2008. ↑ David Remnick, "Exit Havel", The New Yorker 10 February 2003, accessed 29 April 2007., http://www.kirjasto.sci.fi/vhavel.htm. Petri Liukkonen (author) & Ari Pesonen. Kuusankosken kaupunginkirjasto 2008. 4 December 2008. ↑ Žižek, Slavoj. "Attempts to Escape the Logic of Capitalism". Book review of Vaclav Havel: A Political Tragedy in Six Acts, by John Keane. the London Review of Books, 28 October 1999. Retrieved 21 December 2007. ↑ "State Decorations". Retrieved 17 August 2010. This page was last changed on 11 September 2018, at 23:31.